There might come a time in a person's life when they ask themselves how have they remained productive so far without a 12" stylus-wielding tablet with extremely high resolution display. That's precisely the moment Samsung is betting on when it introduced the Galaxy NotePRO - the largest member of its Note family, that arguably started the whole big-screen mobile device swoop with the introduction of the first phablet. 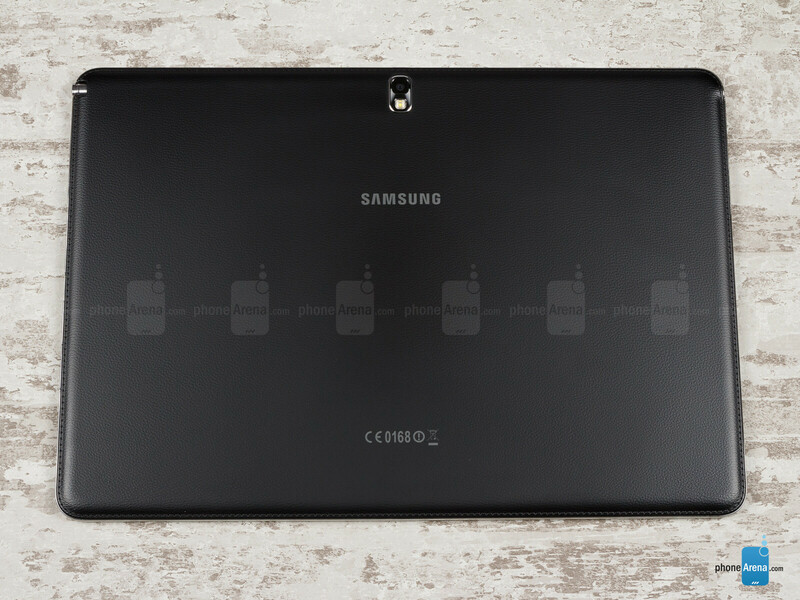 Samsung argues that the 12.2” NotePRO offers PC-like productivity in today's mobile age that blurs the lines between computing device segments, and if we look at the specs of this Android tablet, the company has a point, so let's preview what will be on offer with the newcomer in the Note portfolio, taking some hints from our prototype unit. 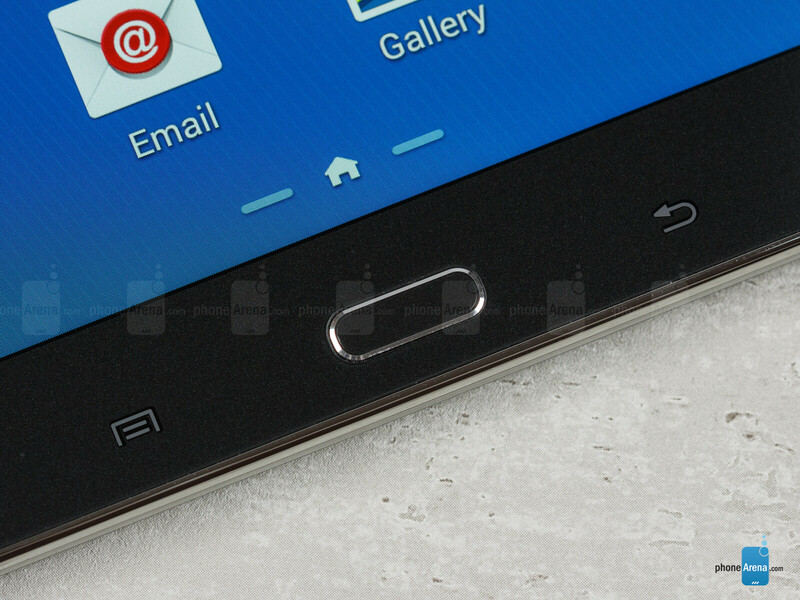 Samsung has used the artificial leather look with stitching accents pioneered with the Note 3 once again. 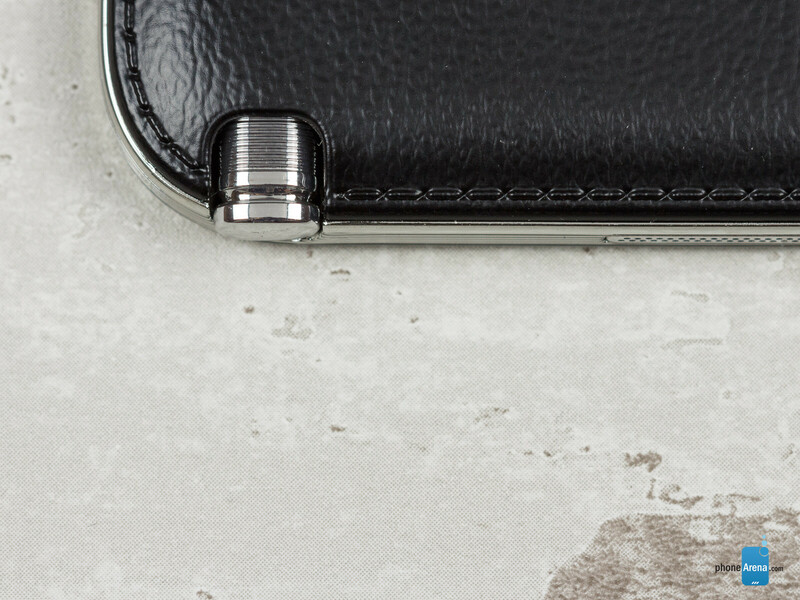 It arguably gives its electronic devices a more buttoned-down and sophisticated look than sheer plastic, and we have to say you can be fooled it is a leather notepad looking from afar. It is still plastic, but nicer to the touch than the usual glossy coat. Glossy, however, is offering more traction for your hands, as it just sticks to your fingers, whereas the leathery back here is more slippery. 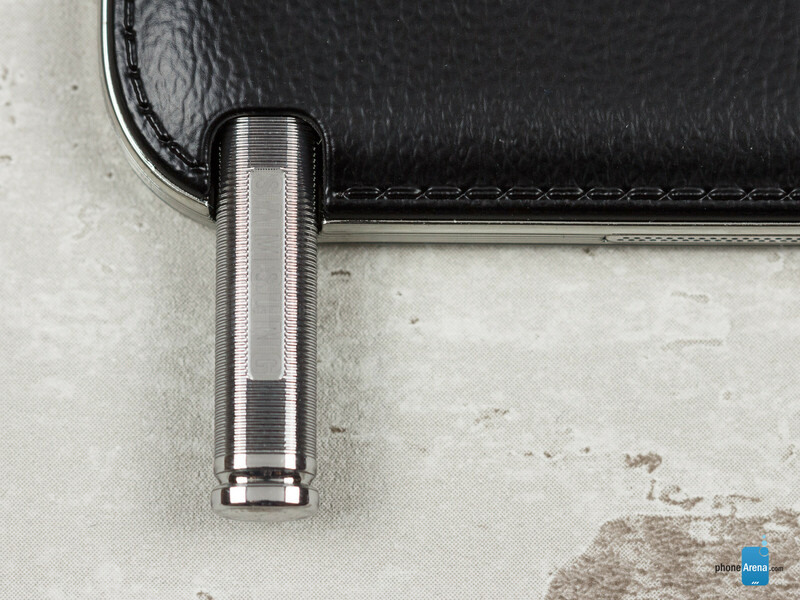 There is a metallic-looking rim surrounding the sides of the NotePRO, further adding to the more premium looks. Despite the elevated leather pattern with edge stitches, though, the tablet manages to stay in the sub-8mm category, which is where all the catwalk stars of the tablet arena belong, too. The exact dimensions are 11.64 x 8.03 x 0.31 inches (295.6 x 204 x 7.95 mm), and we'd say this is as compact as a 12-incher can get, while still leaving some bezel on the side for resting your thumbs during handling. For comparison, one of the closest competitors - the Sony Vaio Tap 11 - sports an 11" screen, and measures more at 12" x 7.40" x 0.39". The issue here is weight, though - at 26.56 oz (753 g), Samsung's largest tablet isn't feathery to carry around, or keep in your hand for a long time. Sony's Tap 11 weighs about the same, but it carries an Intel Haswell processor with the respective fan, powering full desktop-grade Windows 8.1, plus a full USB 3.0 port. When you tack on keyboard folios, like the one Logitech introduced for the NotePRO, and you start thinking about ultra thin and light laptops, like Sony's Vaio Pro 11, which carry much more oomph than Samsung's tablet with this setup. 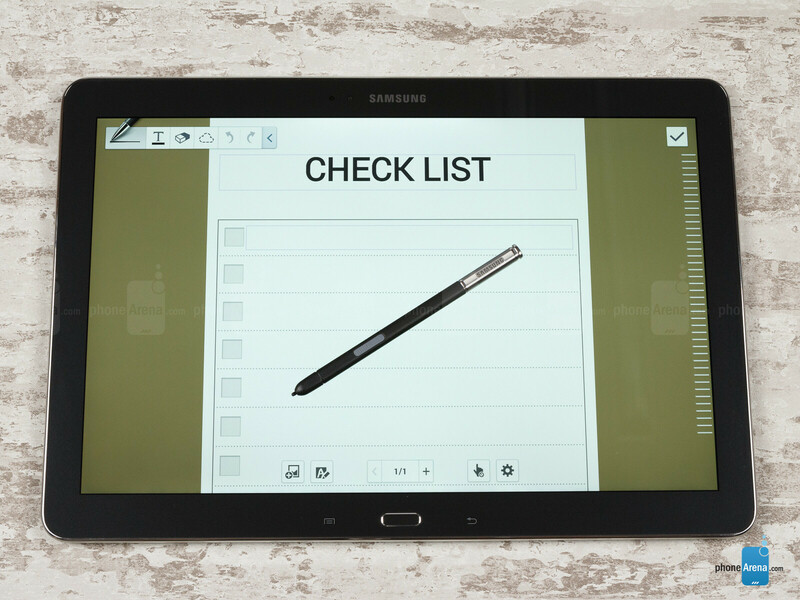 Thankfully, we get Samsung's excellent S Pen stylus with the NotePRO, which sits tucked neatly in a silo at the top right corner of the slate, ready to alternate your productivity urges with doodling sprees. It is very easy to take out or push back in, yet feels snug and not wobbly in the silo. Samsung is betting on such a high resolution display, which not many devices with this screen diagonal are able to offer yet. At 2560x1600, the 12.2" panel crams four million pixels on its surface, and that is more than enough so that even the hardest screen purists won't notice any icon or text jaggies, as well as detail imperfections, from a normal viewing distance. We examined it with a macro lens, and it it seems to be of the PenTile variety, as the pixels are arranged in a diagonal matrix different from the standard “stripe” RGB one, but you can only notice that looking very closely at solid colors, and if you know what to look for. Samsung calls the new screens Super Clear LCD, which is a term used for its LCD screens since the dawn of the original Galaxy S, so don't get your hopes high it is a brand new screen technology, much different than the PLS-LCD panels on Samsung's high-res tablets of late. At 247ppi, however, this is the most pixel density you can currently get from a 12-incher, so who can complain about the screen. It looks good, comes with several modes to choose from, such as Movie or Dynamic, but we will pass a judgment when we get a finalized unit and run the panel through our screen benchmarks. SS made a really good tabet but messed up a by not offering a external backlite keyboard like the surface pro and for the price there are asking for is should be included. The reason I still haven't got a tab is going back to the simple question: DO I REALLY NEED ONE? You see I have a large screen phone, so 7-8"-ers of same functionality minus placing a call never excited me much other than the geekery of having another device (which I don't need). I hold the hi-res large screen phone a little closer, and there you go. Now 'round 10"-ers make more sense, yes you won't hold them with one hand but on the table or your lap, but if you do so, like you did with your 14" to 17" laptop, why not go bigger? 12" makes sense, it's a better fit for your lap (wide enough), has a larger onscreen keyboard (or larger keyboard case) and all content are more comfortable to consume, especially movies. Now I still wouldn't be all that excited if this one didn't have the mutli-tasking options I think are mandatory for the size. Luckily there's slip-screen and windowed mode and the Magazine UX, providing in time you'll be able to add custom 3rd part widgets, can kick some adultery into well... supersized phones that tablets are mostly are without able to place a call. I like the idea of using a mouse too besides a BT keyboard, why not? Now it will come at a price, probably around $600ish, but the Tab version that's only really missing the Wacom digitizer and the pen, if it lands around $450, I'd definitely consider getting it. You could ask this same question to any product out there. DO I REALLY NEED ONE? Do I really need a smart phone? Do I really need an HD TV? Do I really need a new car? Etc. Yes, I need them cause each of them are unique and usable. How a 7" tablet necessary if you have a 5.7" phablet? See my point? Every one needs and wants is different. I can't read comic on a 5.7 phablet. I does it with great difficulty with my 7.7 but I am sure the 12.2 would aid me greatly. Bye bye to my 7.7 soon and good ridden..
anything over a pound or so is considered too heavy in the days of the iPad Air or Tablet Z fashion models, and the NotePRO weighs almost two. - Why PA compares the weights of 10inchs tablets such as ipad air and sony's Z in this review ? Samsung already announced 10inch tablet Galaxy tab pro 10.1 which is *lighter* than ipad air or sony Z. comparing weights of 12inchs tablet with 10inchs tablet? ughh.